Hey, Jules From Go Guilty Pleasures, Let’s Play 20 Questions! Today marks the kick-off of what will hopefully be wildly enjoyable and successful feature here at The Byronic Man: The 20 Questions Interview. It’s modeled after the famous Proust Questionnaire designed to get to know artistic types a little better. Mine’s perhaps not as poignant and sophisticated as the other one, but on the other hand, the other one does not have TV detectives, Deadly Sins and super powers in it. So there. This inaugural interview is with Jules, from the popular and delightful Go Guilty Pleasures. Jules’ site is always enjoyable and very funny, whether she’s writing about her undying love of chipmunks, her awesome dog, or creating pretty impressive videos about why Darren Criss should love her. So with that in mind: Hey, Jules! Let’s play 20 Questions! 1. What quality do you most admire in others? Their ability to compliment me on my appearance and the superiority of my dog, Uncle Jesse. 2. What trait do you most dislike in yourself? My need to be liked by everyone. Hey, did I tell you you look really hot and smart today? 4. What would you like the title of your biography to be? The Blonde Joke’s On You. 5. You’re suddenly made the absolute ruler of your country. What is the first change you make? Friendly’s peanut butter cup sundaes for everyone!!! …You have to say that like Oprah for it to work. Oh, also I would take all of Oprah’s money and redistribute it more appropriately. 7. What 3 songs do you think you’ve listened to more than any others in your life? “Foolish Games” by Jewel (I went through a phase at 15 where I refused to listen to anything unless it made me want to slit my wrists), “Kissing You” by Des’ree (see previous explanation) and every song by John Denver and James Taylor, thanks to my parents’ habit of blasting Denver/Taylor CDs every Sunday promptly at 8am. Every. Sunday. 8. If you could relive one day – either keeping it the same, or changing something – what would you choose? The day I interviewed for a job with the woman who would become Stephenie Meyer’s (of Twilight saga fame) literary agent. I would have worn pants that weren’t two inches too short and investigated what being a literary agent’s assistant actually entailed. Robert Pattinson and I could be sharing tea and scones Right. Now! When reached for comment, scorpions reported to be "hurt." 9 .What is your biggest fear? Scorpions. Duh. Also? Duh. 10. What movie or book has had the biggest impact on you? My favorite movie is “Clueless,” which I thought I liked because of the silly dialogue and bright colors, but I think it must be influencing the way I approach the blogosphere. I never thought I was like Cher until I discovered my place in the WordPress world. 11. What is your favorite thing about blogging? Connecting with other bloggers and reading their hilarious and poignant posts has been an unexpected treat to say the least, but to expand on my last answer, the wildest thing about blogging has been finding my voice. Even though I went to school for creative writing, I never felt like I had a voice until I started a blog. 12. Least favorite thing about blogging? Feeling pressured to read so many blogs every single day takes some of the fun out of it, even though I absolutely LOVE (!!!) all of the blogs I read. I don’t want to skim through a post that someone put their heart and soul into, but sometimes I just don’t have the time to read as many as I’d like to. 13. Which superpower would you choose if you could: the ability to fly, or to turn invisible at will? I’ve always wanted to fly, though I sense invisibility would be a lot more practical; and useful when I feel like spying on the neighbors. Wait. That came out wrong. Fly. Definitely fly. 14. What is your idea of perfect happiness? If you’ve ever been to goguiltypleasures.com, you’re lookin’ at it! In short, happiness to me = champagne, arts and crafts, pop culture and giving away slap bracelets. 15. Which of the 7 Deadly Sins are you most guilty? Sloth. I always feel like I could/ should be doing more, both personally and professionally. My New Year’s Resolution for 2012 is to stay on top of birthdays/ anniversaries/ friends’ kids’ birthdays, etc. and make sure to send at least a text/email, if not an actual card. Hey! 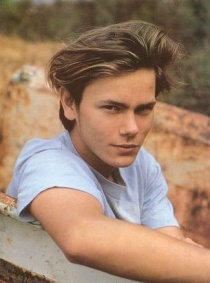 River Phoenix is from Oregon, like me! He grew up near here! 16. What public figure (past or present) are you just sure you’d be friends with, if you ever met? My first thought was River Phoenix, but we totally wouldn’t be friends because I don’t think he had a very good grasp on reality, and I once read that his [uber-hippie] parents sent him into a tent to have relations with an older friend of theirs so he could lose his virginity. I’m just not sure we have a lot in common. I am SURE I would be friends with Kate Winslet, because she has all of the qualities I seek in a bestie: 1) British, 2) singing ability, and 3) ties to Leonardo DiCaprio. Do I have to move onto the next question already? I haven’t even gotten to Michelle Williams, Jimmy Fallon or Sandra Bullock yet. 18. If you could spend a year in any time and place, when and where would you choose? Okay, I know this is probably so wrong to say since I’m a liberal chick from Jersey and all, but I could rock the shiz out of a corset. I think I’d need to do it in London or Paris during the Victorian era. I’d probably pop a few corset strings by eating too many petit fours, though. Dang. I love petit fours. They’re like little cakes so it’s not as if you’re eating a lot, you know? Why are good petit fours so hard to find? Yeah, but does Sydney Bristow have a cool blog? 19. If you could be any TV detective, who would you choose? Sydney Bristow (Jennifer Garner) from Alias counts, right? I love her. She gets to wear sooo many awesome disguises, travel the world and practice her accents! And her dad is Victor Garber. I love Victor Garber. 20. What would you most like people to say about you after you’re gone? I would like people to say that I made them feel, even for a moment, happy in their own skin. …Can someone please cue the James Taylor music? ← Fly Free, Like The Eagle! And Sniff Free, Like The Wiener Dog! And So on! I thought you were going to install a plug-in before posting this that allowed me to ‘like’ it 74 more times? This is your best post yet. 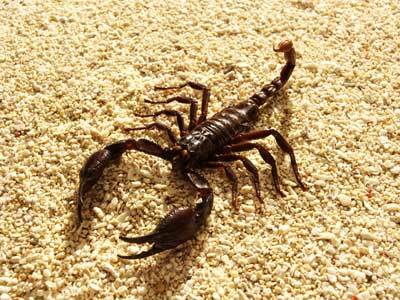 I realize there’s a certain cruelty to posting a picture of the thing you listed as your biggest fear… but on the other hand, the thought of scorpions being hurt and saying, “But, we like you, Jules!” made me giggle. Actually, the scorpion caption DID make me howl, as did your tagging this “blonde joke.” Ha! I love it. But I do hope my childhood nightmares of a sarcastic-talking-scorpion-in-the-basement don’t flare up again as a result of seeing that picture. How about that! I am guilty of sloth, too. I hang from trees by my claws and only come down once every ten days or so to blog. And poop. I think sloth would have been a good pick for my “what animal’s abilities would you like for a day” post the other day. I’m one of Jules’ fans. In homage of her, I dressed a guinea pig in one of her slap bracelets. It was a moment for both of us. So I read her genuflection of you and came on over. I just might have to stay. Well, thanks for coming by! Hopefully you’ll like it here. I’m very nice. 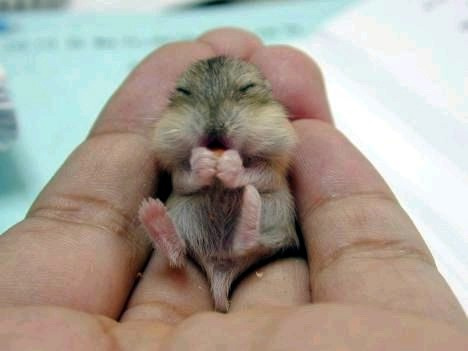 I want to eat that chipmuck, it looks so sweet! Also, I think the 20 Questions idea is a great one. My favourite question is “What 3 songs do you think you’ve listened to more than any others in your life? ” ’cause I think any answer to that would be a really good indication of the kind of person someone is. And on that point: Jules, John Denver and James Taylor were major music fixtures in my house, too. But you haven’t really lived until your father decides to blast “Feelin’ Alright” by Joe Cocker at 6am on a Tuesday and proceeds to make a fool of himself by dancing around the house to it. …my family’s not crazy, I swear! Thanks for saying so, about the “20 Q’s.” I’m a little concerned that it’s too long, but “Let’s play 12 Questions” doesn’t quite have the same ring. Oh, man. I’m starting to wish I had picked different songs now (John Denver and JT aside; I love those guys)! But that would have meant I was trying to look cool…so…I guess you’re right – song picks do say a lot about someone, LOL! Your dad sounds awesome! Byronic Man – I had the same fear: “Who’s gonna wanna read my answers to 20 questions? !” But, they are great questions. I love my sweet Jules chipmunk. And I totally understand the pressure to read blogs, especially by people we really like. But then when are we supposed to write? So frustrating. I want three more hours in the day for reading blogs and tweeting. I’m working on the slap bracelet thing. Just wait! 😉 Its kind of an extravaganza. I should probably be wiring it, huh? But The Byronic Man’s questions were so compelling! Dammit! I actually thought that answer – about the hardest part being reading blogs – was kind of bravely honest. Because it can be tough, and you don’t want to ignore them, but boy can they stack up. And thanks for liking the questions! Right back at’cha, Renée!! I cannot WAIT to see this slap bracelet extravaganza (not to mention post Byronic Man’s WHOLE FACE!)! I am so brave, Byronic Man. That’s why I get to be the dinosaur. This post is awesome. Let me know if you need another 20 Questions blogger. I promise to watch my f*&$#%g language if you want. Sounds good – I’ll send you the questions. And you can use your #&%@! *& language any way you’d like. The goal is that it becomes this desperately sought-after honor, with people resorting to scandalous bribes and desperate flattery. We’ll see how that goes. I’m totally with you on the corset. Alas, I have to settle for only wearing them sometimes on Halloween. WHY oh why haven’t I thought of using Halloween to take advantage of corset-wearing?! Halloween 2012 – it’s ON!! Um…do you know where to find a cheap but dashing corset, that will still allow me to fill up on vodka and peanut butter cups? I’m not sure there is such a thing as a cheap corset. But I got one from Hot Topic a few years ago that did the trick. Well, thanks for coming by! Oh man…I was gonna answer those questions until I got to #7 and realized my first choice of three was Straight To Hell by The Clash. I can think of about 28 times (off the top of my head) where you’ve helped me feel more comfortable in my own skin. A few of them even happened while reading this post! Many giggles. Also much warmth–the literal kind, that is. This hotel heater is not nearly as awesome or effective as you are! You know sometimes you almost make me blush, Deb! And I like it. Hope you had a safe trip home and are all warmed up!! What a fun game! Love the questions and the answers, Jules. Did you win fabulous and exciting prizes, like Rice-A-Roni? Hey Mr.Byronic. I’ve seen you around the blogosphere for ages and decided to follow Jules over here like a deranged stalker. Now I’m hiding in the bushes under your blog window eating peanut butter cups and laughing a really, really creepy laugh. Well, whatever brings you to my window, I’m glad! And we have a ton of peanut butter cups left over from Halloween (we may have forgotten to turn on the porch light), so never fear. Thanks, Peg! Did you hear Byronic Man has leftover p.b. cups? Meet you there! !